A mistrial has been declared for the fourth time against John Gotti, Jr. The jury did not find the testimony of mob informants credible. Several were unconvinced by the prosecution case that relied on the increasingly controversial use of mob informants....[S]ome jurors said after the trial ended that they did not find a self-confessed multiple murderer a convincing witness. The Government ought to give John Gotti, Jr. a rest. After 9 days of deliberations in a 4th retrial, the jury announced it was deadlocked. But the Judge gave them the dynamite charge, rather than let them go. The end seemed near for the fourth racketeering trial of Gotti when the jury said it could not reach a unanimous verdict in a note late in its ninth day of deliberations, a record for the Gotti trials. Gotti, 45, blew a kiss to his family before taking his seat. After rejecting a defense request to declare a mistrial, U.S. District Judge Kevin P. Castel summoned the jury and delivered a so-called Allen charge, instructing jurors to try hard once more to come to a consensus. Update: No bail for Gotti. 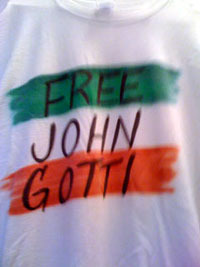 Looks like I'll be wearing my "Free John Gotti" t-shirt to bed tonight. The Government just can't get enough bites at the apple when it comes to the son of the notorius, deceased mobster. John A. Gotti has been charged with conspiracy for his role in a sprawling cocaine trafficking operation and in three mob-related killings in 1980s and ’90s, the United States attorney’s office in Tampa, Fla., announced on Tuesday....Mr. Gotti has been prosecuted four times before on charges related to organized crime; he pleaded guilty in the first case but contested the later charges, resulting in three mistrials.